When Samsung announced their new flagship, the Samsung Galaxy S5 at the Mobile World Congress, the toned down reaction and applause was probably something they did not anticipate. Now that the device is set for world wide release in the next few hours and having had the opportunity to unbox the device before launch, I am quite certain that perception are set to change. Samsung’s new flagship is a marvel in terms power, display and some really neat features that may just set a new benchmark to other mobile device manufactures. 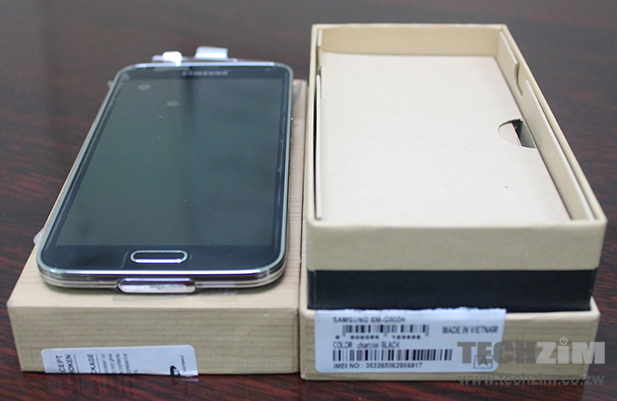 The Galaxy S5 we reviewing was provided to us courtesy of Goldtech Electronics and they are already selling the device for $1200 – a price that will literally blow away many. 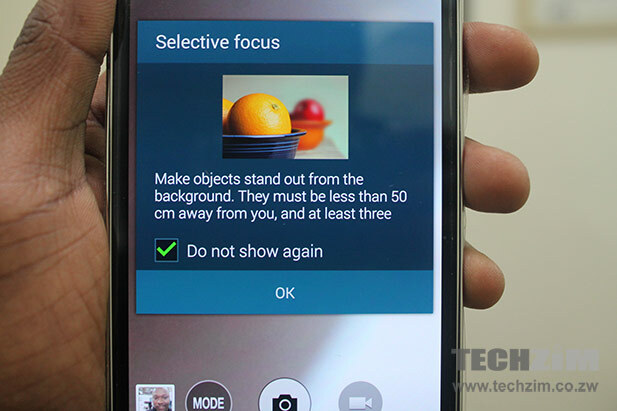 This is probably the biggest drawback on the Samsung Galaxy S5. Visual appeal is no where near my thoughts on the iPhone 5S or even the Huawei Ascend P6. Slightly bigger than it’s predecessor and 23g heavier than the iPhone 5S, the S5 is relatively big and has some noticeable weight on it. The metal side casing around the phone is humpy giving it an almost rugged feel, something that the perforated back only adds to. I definitely felt that the phone is bold, masculine and lacks some elegance. 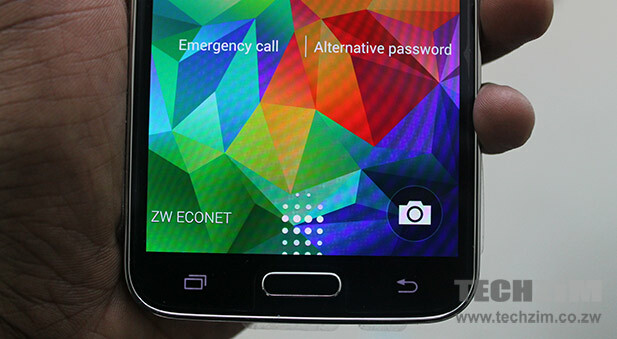 The Samsung Galaxy S5 has an IP67 rating making it dust and water resistant. Maybe they had to compromise heavily on looks to achieve this. 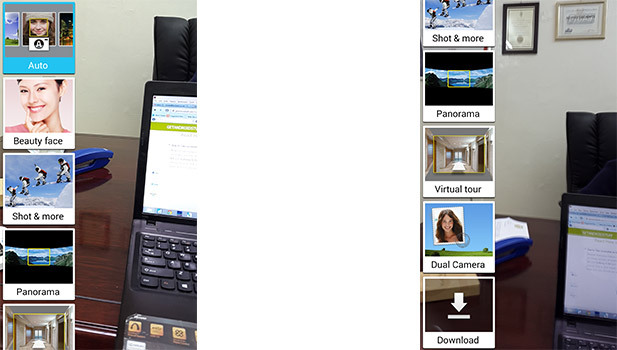 The Samsung Galaxy S5’s display quality is something to marvel. 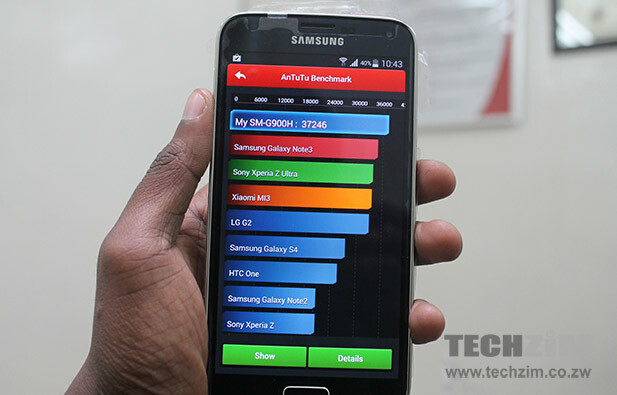 The 5.1″ Super AMOLED capacitive touchscreen some real quality to it. Colors and images come out crisp without any room for dullness. Responsiveness is also on point. Video display is also quite brilliant. I would put it at par with what I experienced with we iPhone 5S in terms of picture quality, only that the S5 screen size gives videos some presence and gives life to the whole experience. I cant offer a conclusive verdict on this aspect because this is not a comprehensive review. But from my several hours worth of interacting with the S5, there is nothing to say that the Quad-core 2.5 GHz processor is not impressive. The multi-tasking feature in particular was brilliant as I could seamlessly pile on different tasks on each other without the phone showing any signs of distress. 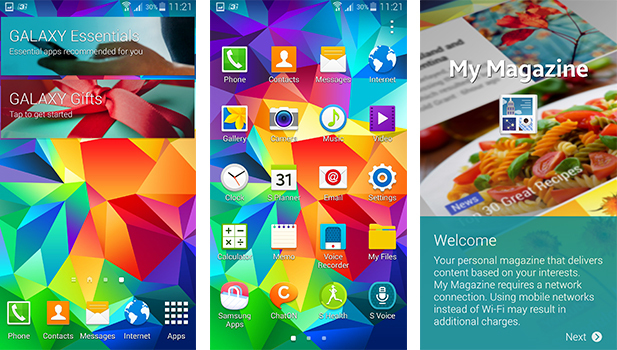 Now this is one area I truly found the Samsung Galaxy S5 impressive. Never mind the 16 Megapixel capacity (That’s been beaten already), its features like the dual mode, selective focus and virtual tour shot that will get smartphone camera and selfie enthusiasts excited. My favorite feature was the dual mode functionality which allows users to use the front and rear camera simultaneously for both photos and video. Unfortunately, the front side is mainly for selfies as that particular side of the shot will be framed as seen below. The Selective Focus Feature also gives smartphone photographers an opportunity to do something that novice professional photographers often fail to do – give in focus subjects a shallow depth of field. Through the Ultra Power Saving feature, Samsung has also brought something new to battery power management for smartphones. 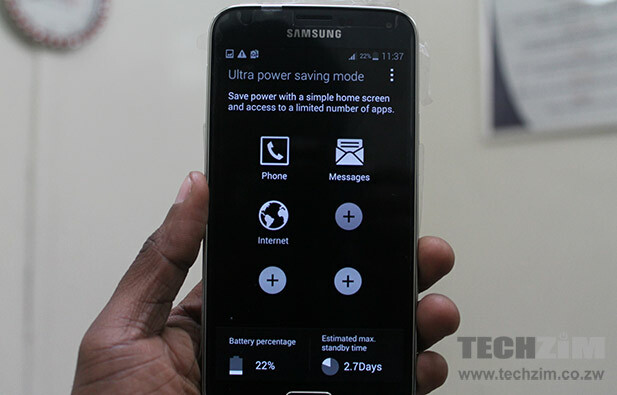 Activating Ultra Power Saving mode will instantly turn your once genius Samsung Galaxy S5 into a dumb phone capable of only calling, browsing and texting. You can only add three, low on power apps like the calculator and chatting apps in this mode. The benefit is activating this mode will give you a lot of time on standby. I activated this feature with 22% of power left and it indicated that I could go for over 50 more hours in standby mode (receiving calls, texting and low quality browsing). The benefit is great but I felt a bit hard done in being unable to connect to wifi or do simple task like capturing screenshots whilst in Ultra Power Saving mode. Th battery itself is an Li-Ion 2800 mAh battery capable of 390 hours standby and 21 hours of talk time. It was hard to judge the it’s efficiency due to the limited time we had the device. 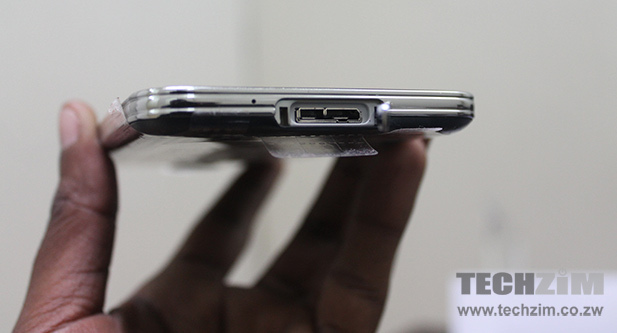 Unlike the batteries on the iPhone 5S and the Huawei Ascen P6, the battery on the S5 can be detached from the device. I had hoped on progress on this front from Samsung. We managed just one benchmark in this unboxing. 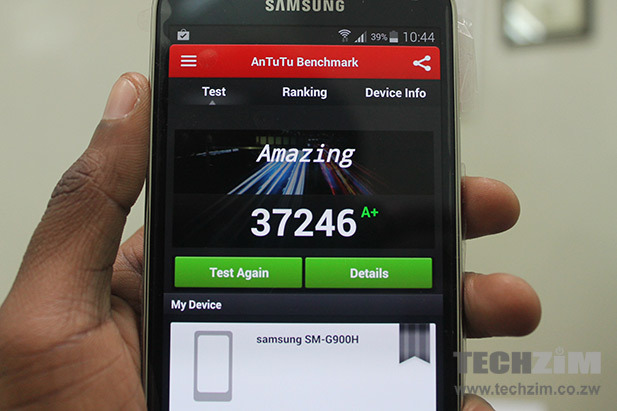 Unsurprisingly, the Antutu benchmark gave it it amazing score and says the Samsung Galaxy S5 is the best Android device on the market. 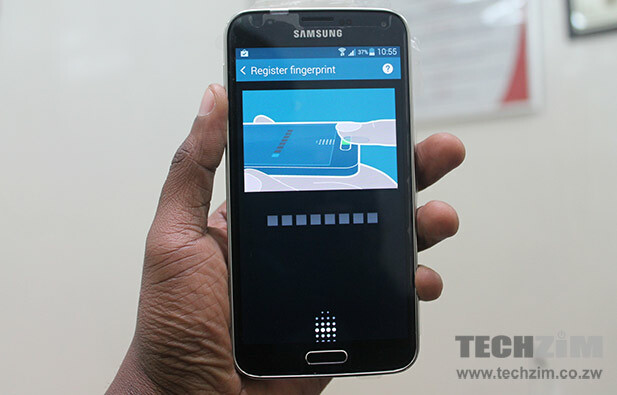 Following after the iPhone 5S, the Galaxy S5 also has a finger print scanner. Setting it up was a bit demanding as I had to scan my finger print several times for recognition. The worst part is that there are no prompts to take you through the process and half the time I thought I was doing it wrong. However, once the scanner is set up, just one glide with your recognised finger over the marked bottom part of the screen and the home button will unlock the device like a breeze. I liked it. The Samsung Galaxy S5 also has a Kids Mode feature which like the Ultra Power Saving mode, turns it into a device with just a fraction of it’s true potential. 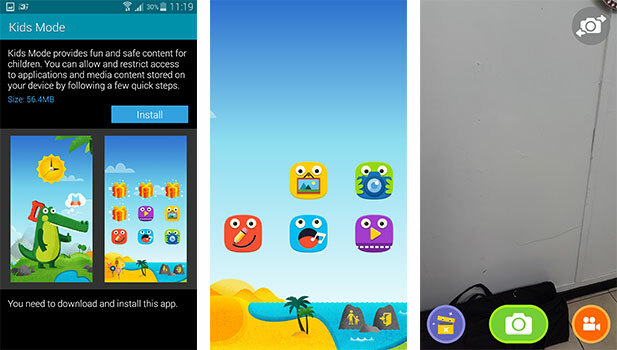 Only this time the device will become a kid’s toy with childish icon (now words) on apps. I did not do much in this mode as I did not know the characters and it was quite difficult to exit this mode (no word, just childish icons and all). 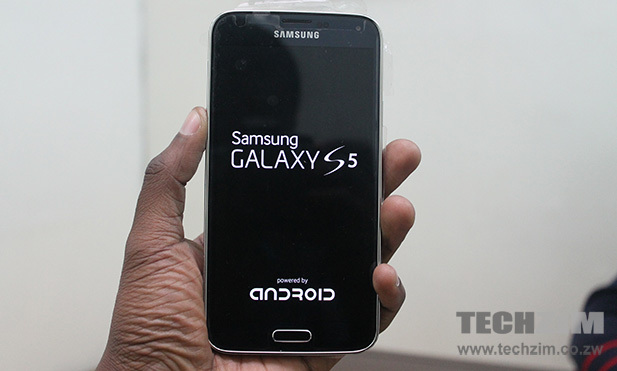 The only thing stopping me from owning a Samsung Galaxy S5 is the price. 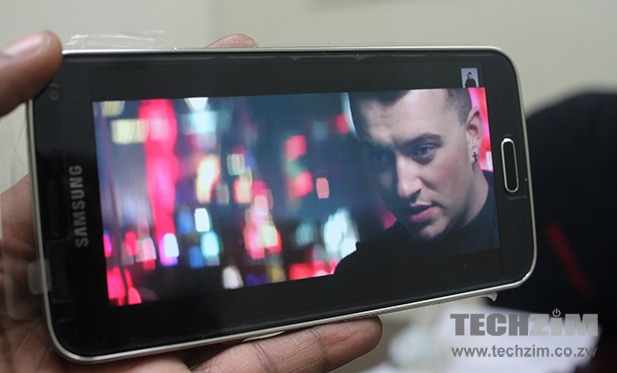 The features, apps and sheer quality makes it the next generation smartphone in my opinion. The camera is outstanding and it will be a while before I get over cool features it has on offer. I’d be more happy if the device was at least an inch smaller. I prefer compact smartphones and I sincerely hope the iPhone 6 won’t have more real estate. The $1200 price tag is for the rich and eager early adopters and I hear several, not just Sir Wicknell, are already S5ing in Zimbabwe. Hopefully, as more retailers start stocking this beauty (maybe beast) the price will fall and maybe more can afford it. 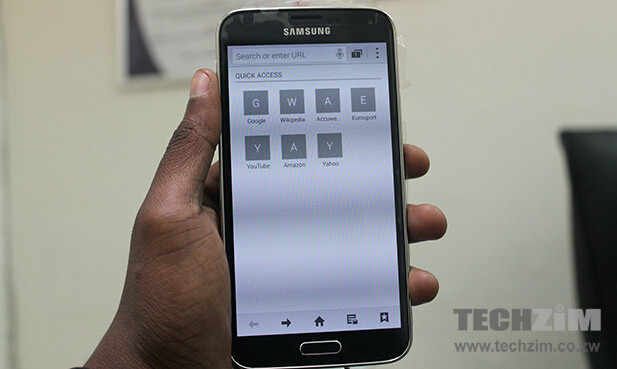 The Samsung Galaxy S5 unboxed here was provided to Techzim courtesy of Goldtech Electronics, a leading retailer of consumer electronics in Zimbabwe. 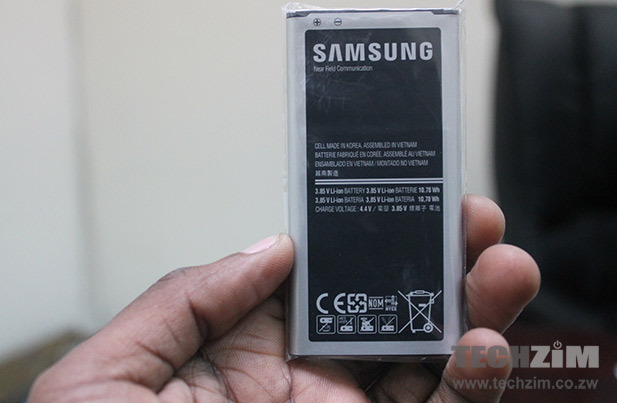 Unlike the batteries on the iPhone 5S and the Huawei Ascen P6, the battery on the S5 can be detached from the device. I had hoped on progress on this front from Samsung. i don’t follow, whats wrong with a detachable battery? Batteries have a tendency of discharging too quickly after some time, at which point replacing becomes the only option. Valid point Chandida. I have never come across a replacement iPhone Batteries and most tabs have inaccessible batteries.Maybe since devices have shorter life cycles, the point of battery discharge can be the point of disposal? It completely does away with the need to be constantly wired to a power outlet, carrying around clunky external ‘juice’ packs, or having to restrict myself to ‘whatsapp only’ mode when I travel. A video would have been aweseome though. I have seen many video reviews of the phone but a Zimbabwean version would have been awesome, considering that many are not on unlimited data plans etc. Anyway thanks. Howevever, for 1200 I will wait a while maybe end of year when the price falls or i can chance with a broken screen up for a quick sale. great job on reviews guys, but i think you should also make videos of these reviews and put them on youtube. keep up the good work! WANT IT WANT IT WANT IT!! Love that it comes in Blue as well – makes a nice change from black or white. However, I will wait a while until it is a more reasonable price! WOW – That site looks awesome – been looking high and low for an online retailer as good as this. How long they take to deliver, and what payment options have you used? again, Techzim should really consider doing videos for this stuff and all that other mobile wallet jazz. Your move TZ. 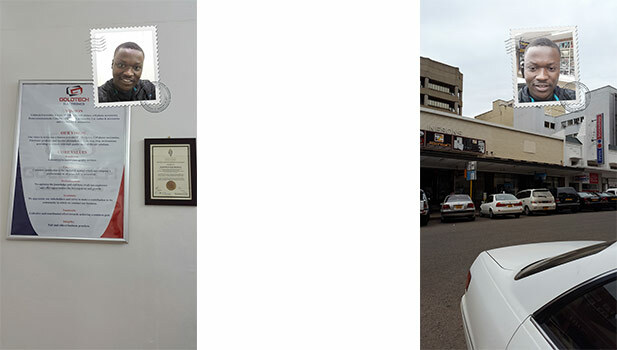 Makuda kundijairira manje. I don’t do Android! I’m rocking my diamond encrusted iPhone 5s.